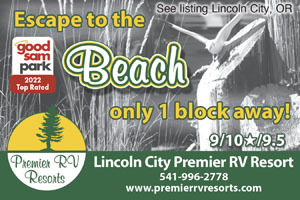 This is a high-quality RV park on Hwy 101 in Lincoln City, OR. It is on the opposite side of the highway from the beach. The driveways are asphalt and the site pads are a combination of brick and concrete with small gravel mixed into the concrete. This creates a very attractive textured surface. They have a few pull-through sites but most are back-in with full hookups. There is no picnic table, but they have a sort of bench/mini-table. I would rate the free WiFi as 7 out of 10, generally good availability. All facilities are very nice and well maintained including very attractive landscaping. The cost is a little higher than average, of course. Their website isn’t clear that there is tax charged, so if you look at the rates and you have Good Sam, the taxes will essentially eat up the Good Sam discount. We paid $58.60 per night including tax. Great location but our pull thru site required us to unhook in order to move the rig back to where we could reach the hookups. Also, office only open 9-5. Water main broke while we were there and it was during a re-roofing job on the office, so things were a bit chaotic. Bad timing, will try again, but hopefully there are other sites where pull thru really means you can pull through without having to unhook the Toad. Love the location with view of the Pacific Ocean. Friendly and really helpful staff. Restrooms clean and accessible. The only thing about the we didn't like was tight and has hardly any space to park a pickup truck. All in all we will be back. We've stayed here before, and management has changed and so have many of their policies since we last stayed. This used to be a great place. Now management is dismissive, disrespectful and obsessed with pet waste. They follow every pet owner around in golf carts to make sure their pet doesn't pee or poo in an inappropriate spot. The facilities have not been as well maintained as they were before either. If you have a pet, you will want to choose another location to stay. We have always picked up after our pet, and found their treatment of pet owners rude and overbearing. The sites are extremely tight we would not have gotten in our spot had the people next to us been home. There is absolutely no room between sites. It is extremely hard to get your rig around several of the turns in the park. It appears that the full-timers have most if not all of the good sites and have not kept the park up to a "Premier" rating. Nice fenced in dog run but was covered in pea gravel and our dog didn't like walking on the gravel. All the people were very helpful and nice. 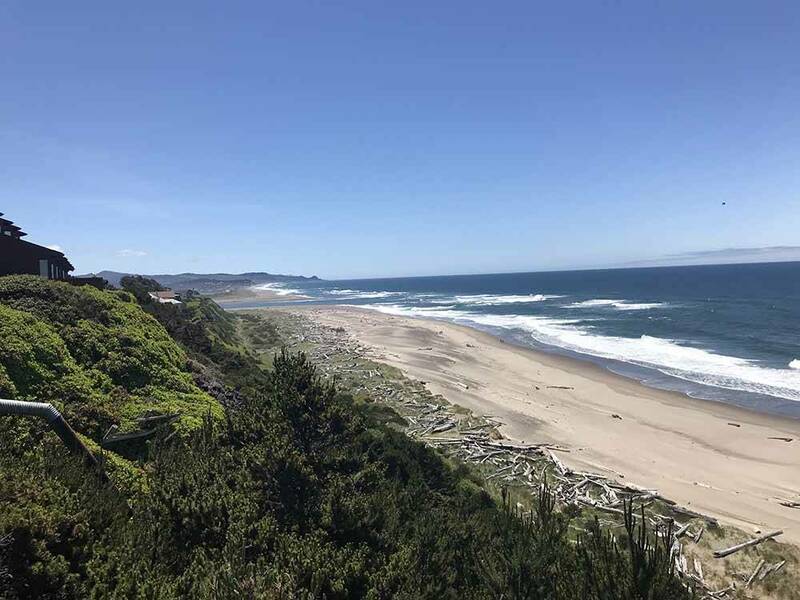 Great location with view of the Pacific Ocean. Friendly and really helpful owners and staff. Restrooms clean and accessible. Pads were very well designed and equipped. Only downside is that this park is tight and has hardly any space to park the pickup truck. Gets tricky, requiring residents to move their trucks to accommodate arrivals and departures.